Located in Provincetown, Massachusetts, Café Heaven serves up brunch and dinner, with a New American flair. A favorite of locals and visitors alike, Café Heaven serves breakfast, lunch, and dinner daily. A lively place by day, Heaven’s floor-to-ceiling windows offer some of Ptown’s best views of the Commercial Street bustle. An extensive menu features the freshest foods available, from fluffy omelettes to Heaven-made granola and fresh squeezed juices. Lunch includes the best sandwiches in town, crisp café salads, and Heaven-made soups. Nightly, the candle-lit dining room has a more romantic and urban vibe. Café Heaven also offers create-your-own hamburger and pasta dishes with endless possibilities. Specials feature local seafood, organic meats, and seasonal vegetables. Heaven’s selection of beer, fine wines, and creative cocktails, as well as Heaven-made desserts complete a heavenly experience. Our eggs are prepared in fresh sweet butter! 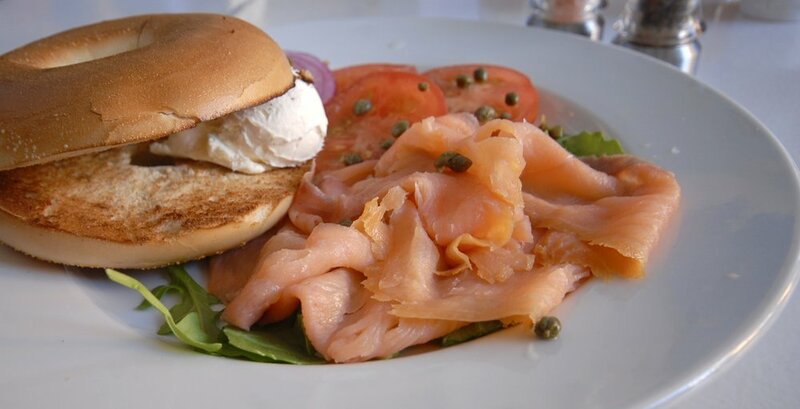 On handmade english muffins served with heaven fries or arugula salad. Comes on a heavenmade english muffin or bagel. All sandwiches are served with Cape Cod chips or creamy kale slaw & a pickle. 10 oz. pure Angus beef served on a toasted brioche bun with arugula and tomato, accompanied by your choice of handcut fries or creamy kale slaw. COPYRIGHT 2018. CAFE HEAVEN, INC.